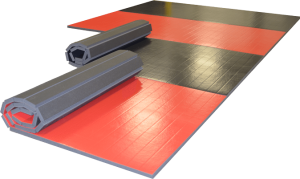 As you enter your school’s training room, have you ever wondered how those mats got on the floor? Do you know how long it takes to put those mats down? Do you realize your senior instructors and master instructor take hours every week to clean up the sweat, dirt, and grime from those mats? How many times do they have to remind you to wipe off your feet before entering the training room? If you have never thought of this before, you may want to. I call this “Respect thy instructor, honor thy mats.” Not only do they put in blood, sweat and tears to help you become a better martial art student, but they also do the same with cleaning the mats on the floor, to keep you safe from bacteria and anything else that gets treaded in on them. Some instructors do this nightly, others do it every other day, and then some others every other week, depending what the school’s schedule is like and how dirty they get throughout the day. They actually have to take them apart, like tile (unless your school has only one long mat, in which doesn’t get taken apart in order to be cleaned). Honor thy mats next time. Your instructors should not have to keep reminding you about no socks on the floor. Nor should they have to keep reminding you about wiping your feet, unless you are a beginner. But after a week of a beginning martial artist in training, you should know only bare feet are allowed on the floor. The only exception is when you are sparring, when you have to wear protective gear on your feet. Respect thy instructor, honor thy mats. If you enjoyed Respect Thy Instructor, Honor Thy Mats, like and comment please.